The sad news of Steve Allen's passing crossed my desk in early November 2000. In the show business world he was considered one of the greats. Steve Allen sang, wrote books and songs, and was a comic, appearing on Broadway and in films. But he was best known as a pioneer of late night television. After a stint as a radio disc jockey in Los Angeles and a two year CBS-TV variety series, he launched Tonight on NBC's New York station in 1953. One year later, the show moved to the NBC network and has aired continually since then. Throughout those years, the Tonight show has had many hosts, including Jack Parr, Johnny Carson and Jay Leno. In 1956 Allen began the prime time Steve Allen Show in the Sunday night slot opposite The Ed Sullivan Show. This show aired until 1960 and was in syndication through the 1960's. 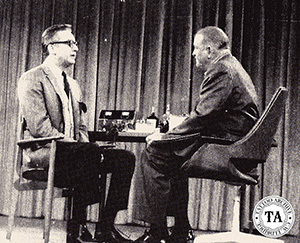 The Steve Allen Show was revived briefly in 1967 and again in 1980. Television was only part of Allen's show business life. He stared in the Benny Goodman Story in 1955 and played himself in The Sunshine Boys and Casino. Johnny Carson had this to say about Allen. "All of us who have hosted the Tonight show format owe a debt of gratitude to Steve Allen. He was a creative innovator and brilliant entertainer". One of the lesser known items about Steve Allen is that he was tattooed on national television in late 1950's. The design was four dots, and as the tattooist said, "It was just to say he was tattooed." Allen's tattooing was done by Pike tattooist Lee Roy Minugh. It is unclear how Lee Roy came to this assignment but in his own words, "It was a tremendous breakthrough, the Steve Allen Show really put me over the top." Minugh himself was first tattooed in 1924. He learned the art on the circus lot and settled into Los Angeles in the 1930's. His first shop was in the back of a book store. 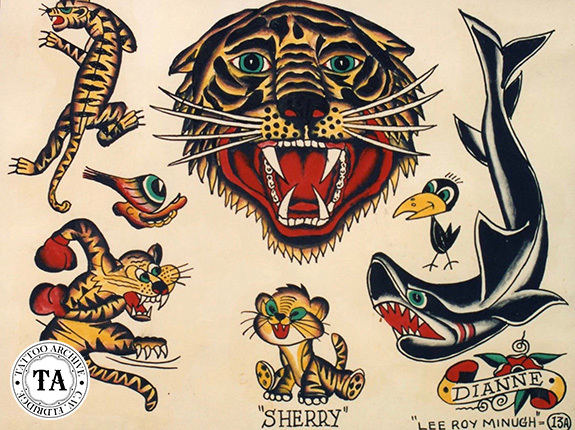 Later Lee Roy moved to the The Pike in Long Beach, California located at the foot of Pine Avenue just below Ocean Boulevard, The Pike was a world famous location for tattooing on the west coast. Often called the "Coney Island of the West" The Pike started as a lowly pier built in 1893 and grew into one of the largest amusement parks in the country. .